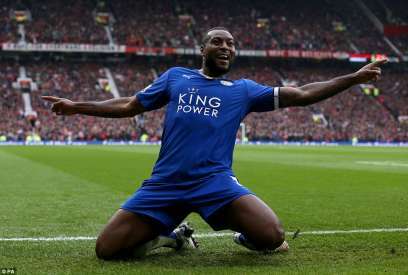 Leicester City must wait at least one more day for their first-ever Premier League title after drawing 1-1 with Manchester United at Old Trafford on Sunday. Claudio Ranieri's side failed to get the victory that would have brought the silverware but they will be crowned champions on Monday if second-placed Tottenham Hotspur, who trail them by eight points, fail to beat Chelsea at Stamford Bridge, where they have not won since 1990. 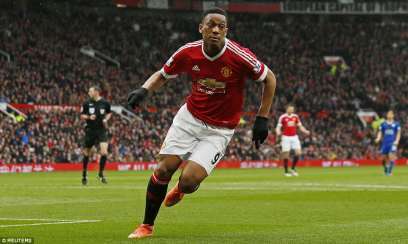 Hopes of a Leicester triumph on Sunday suffered an early setback when striker Anthony Martial put United ahead with a neat right-foot finish from Antonio Valencia's eighth-minute cross. The goal galvanised Leicester, who equalised nine minutes later when captain Wes Morgan headed home a Danny Drinkwater free kick. The visitors thought they deserved a penalty when Riyad Mahrez clashed with Marcos Rojo in the United area, but without the suspended Jamie Vardy they lacked their usual threat on the break. United could have grabbed a late winner but Leicester keeper Kasper Schmeichel was quick off his line to foil the advancing Memphis Depay. "It was very tough. Manchester United dominated possession and we had to dig in and be resilient. It's a point and it's a step in the right direction," Morgan told reporters. "It proved to be an important goal and to score at Old Trafford was a great feeling. It's not ours until we get two hands on the trophy." Leicester finished the game with 10 men after Drinkwater was sent off for a second bookable offence five minutes from time. The midfielder will now miss Leicester's next game at home to Everton, when victory will secure the title even if Tottenham beat Chelsea. 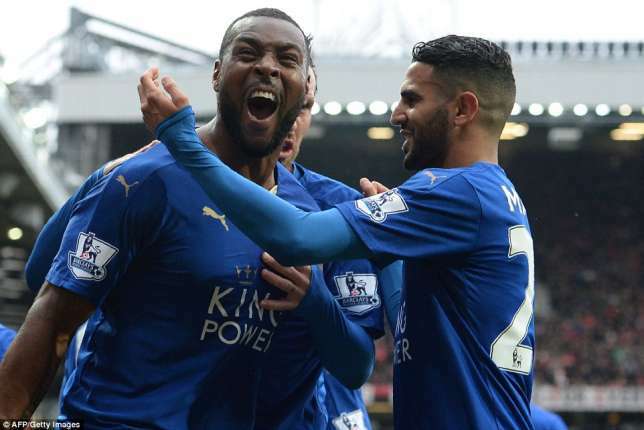 "We knew it was going to be tough," Leicester fullback Danny Simpson said. "The last thing you want is to go 1-0 down early on but credit to the boys, we kept going. We're happy with the point - it would have been nice to have won it here. We'll try and get together tomorrow and watch the game. We'll keep going and see what happens." 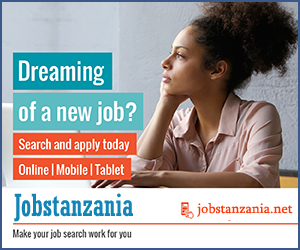 United climbed one place in the table to fifth but are four points behind fourth-placed Manchester City, who play later and Sunday and occupy the final Champions League qualifying place, with three games left. "I think we played one of our best matches of the season, but it was not enough," United manager Louis van Gaal said. "Leicester City deserves to win this championship. They have very good organisation, but we had a lot of chances."